Make your perfect day even more memorable with a stunning bridal bouquet. Wedding flowers allow the bride to express her individuality and create a cohesive look, whatever her color scheme and theme. Bridal bouquets can be exactly matched to the bride's wedding gown or can be contrasting to create an eye-catching feature and talking point. 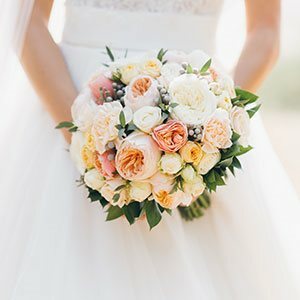 Whether you prefer a traditional white wedding bouquet with time-honored classics such as white peonies or dahlias, or contemporary color mixes with exotic shapes, fresh bridal bouquets should always include the bride's favorite flowers. Lovers of sweet vintage chic may opt for pastel-colored peonies or ranunculus for their delicate, pretty look and romantic connotations. Those with spirited personalities may favor bold blooms such as poppies or orchids to showcase their uniquely quirky character. Some bridal favorites include pink lilies with orchids, colorful daisy and red rose bouquets. Bridal flowers may be arranged in simple, elegant bouquets to represent grace, purity, and dreams, or in lavish displays to convey a sense of celebratory joy and happiness. Whether sophisticated and understated or sumptuous and dramatic, wedding flowers are the ultimate symbol of the love and devotion shared between two hearts. LolaFlora is an expert in making fairytale dreams come true with flowers! Ordering your bridal bouquet online with us couldn't be easier. Our stunning flower bouquets come in an array of shades and styles to help fill your wedding day with color, fragrance, and wonderful memories you will cherish forever. Cheap bridal bouquets are also available for the bride that is on a budget. With a wealth of choices and international delivery, our online florist service guarantees that you will discover the wedding flowers that your heart truly desires. Along with bridal bouquets online, you can also order flower arrangements as table centerpieces for your wedding. Floral centerpieces will add both beauty and a romantic flair to the church or reception hall. Make decorating easy when you order mixed bouquets online for placement on the altar, church pew or to use as bridesmaid bouquets.